Milk thistle and dandelion is a popular combination for people who seek to promote liver function. Dandelion root can also promote gallbladder function, stimulate your appetite and act as a digestive aid, according to the University of Maryland Medical Center (UMMC). Though both herbs are considered safe for most people in recommended doses, side effects can occur. Consult a health care provider before using this combination because you'll need to avoid it if you have certain conditions, are pregnant or are nursing. Both dandelion and milk thistle can cause nausea. Dandelion also has mild laxative effects, and diarrhea and menstrual changes are sometimes associated with using milk thistle, according to "The Essential Drug-Herb-Vitamin Interaction Guide," by George T. Grossberg and Barry Fox. If you're sensitive to sesquiterpene lactone-containing plants, watch for allergic reactions, advises Oregon's Wild Harvest, a supplement manufacturer. These plants are in the daisy family, also known as the Asteraceae family. Avoid dandelion-milk thistle supplements if you react to chrysanthemums, ragweed, yarrow, marigold, chamomile or iodine, the UMMC says. Dandelion can cause gallbladder inflammation, according to Grossberg and Fox. If you're diagnosed with gall bladder inflammation or bile duct obstruction, you should avoid products with this herb, the UMMC says. 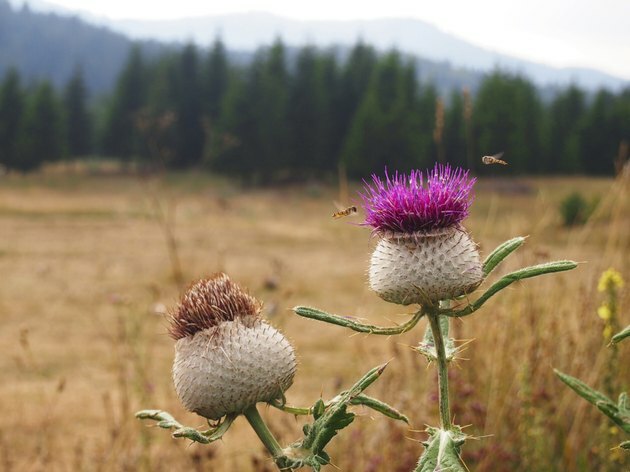 Milk thistle might have estrogenic effects in your body, according to Grossberg and Fox. If you have a history of hormone-related cancers, avoid products with milk thistle, the UMMC advises. Such cancers include uterine, breast and prostate cancer. Dandelion can interact with lithium by worsening side effects associated with the drug; with quinolone antibiotics by increasing absorption of the drug; and with antacids by interfering with their effectiveness. Milk thistle can interact with several drugs because the same enzymes that break the herb down in your liver also break down the medications, according to the UMMC. These include anti-anxiety drugs, drugs for high cholesterol, allergy drugs, some cancer drugs and blood thinners. Talk to a doctor before using dandelion-milk thistle supplements if you take any of these drugs. Also talk to a health care provider before using milk thistle if you take antipsychotic drugs, phenytoin for seizures or may use halothane during general anesthesia. Can I Take Ashwagandha With Prescription Medicines?